Here's a review of a book by a local Miami developer. The image below was sent to me by a reader, Harry Emilio Gottlieb, who "annotated" the cover. 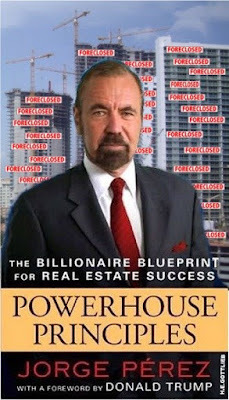 Powerhouse Principles: The Billionaire Blueprint for Real Estate Success. Jorge Perez. Celebra. 288 pages. If Jorge Perez were not a successful Miami-based developer, I'd probably never open this book. No knock on him, but most tomes professing ''this is how I did it; this is how you can do it'' are boring and loaded with self-righteous pontification, glad-handing, name-dropping and other effluvia. Perez describes himself as a salesman, and he's likely a terrific talker, so the text seems like it was dictated, then transcribed and edited. That's good and bad. Most of Perez's verbal idiosyncrasies and repetitions were probably excised, though several may remain, as the editing is a little loose. Regardless, once one adjusts to its rhythm, it's a breezy read, but tighter editing and the imposition of a bit more structure would have improved it. As the book stands, it's hard to see a consistent thread or narrative spine, other than Perez's positive tone. Indeed, the author's enthusiasm for his profession and his role in it is palpable, and he obviously delights in offering an expansive review of his projects and the wisdom he gleaned from them. I enjoyed reading about efforts to develop properties in areas that conventional wisdom had determined as being unworthy, like Little Havana, or unlikely, like Brickell. But I didn't see anything that was terribly revelatory or newsworthy. Regarding the title, as a ''blueprint,'' it's a bit like the prep for a rhinoceros stew recipe; ''first, catch a rhino.'' Uh, right. While it may be possible, as Perez declares, for almost anyone to achieve what he has, in reality few can and fewer do. As a set of principles, the text may ramble a bit, but the author is very consistent in his admonitions and exhortations for conducting business in an honest, ethical and upright manner. He also advocates smart things like striving to create a perception of value, establishing personal connections with vendors and business partners by leaving some money on the table, and preparing meticulously before making any offer. Most, if not all, of the advice is pretty bulletproof and unimpeachable, but it's doubtful that he would recommend doing something illegal or unethical in print. In real estate, the most important thing is location, and in investments, it's probably timing. Given the current moribund state of the market, it would have been worthwhile to have Perez's insights on this issue, especially for ways investors might salvage projects for which financing has evaporated or, worse, situations where they've become ''upside down,'' owing more than the property's current market value. For real-estate investors and professionals who track Perez's projects, this book will prove worthy of attention, and perhaps even inspire some annotation. But for those of us whose holdings consist of their family residences — in partnership with a bank — it may prove somewhat less riveting.